UPDATE: The 5 day give-away of my E-book has ended. I can say it’s been a tremendous success. So much so that I don’t want to disappoint you, so if you still want a free copy, you can sign up (and get 60 Pieces of Blogging Advice too), or just get your Kindle copy for only a couple of bucks. When I realised that the various jobs I held over the past had some major social business elements in them, I started to take the term serious and started digging into it more and more. Eventually leading me to write Why? 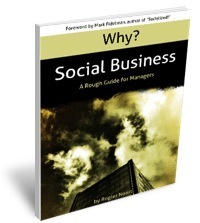 Social Business, a 33 page E-book explaining why a business should get on this train. I wanted to make the “why” crystal clear for me and anybody who’d read the book. My first real moment where I could name “Social Business” was when I saw an interview with Mark Fidelman, done by Dino Dogan. Mark had written a book; “Socialized! : How the Most Successful Businesses Harness the Power of Social (Social Century) “, and the way he described it fitted perfectly with what I had in my when it came to social and business. At least in part. Add to that (mandatory reading): “What’s the Future of Business: Changing the Way Businesses Create Experiences ” by Brian Solis and “Social Business By Design: Transformative Social Media Strategies for the Connected Company ” by Dion Hinchcliffe and Peter Kim and the image becomes crystal clear. What I learned was that Social Business is so much more than just implementing a tool, a piece of software or adopting a social media platform. In fact, technology (and social media) is only the enabler. It’s people who are the driving force behind a Social Business. The philosophy of a company needs to change, the mindset. For some companies their whole way of thinking and day-to-day routine must change. These are some significant realisations. It’s still business mind you. There still has to be a ROI, the changes still have to be lead to results. I would not go as far as saying it’s a project. A project, by definition has an end. Social Business doesn’t “end”. It’s something you do. Sure, the implementation of a specific tool, or the change of a workflow are still projects. It the long run, social business will become business as usual. Back to the book and this post. I asked Mark Fidelman to write the foreword of my E-book. Mainly, because it was he who opened my eyes and I wanted to thank him for that. The premise of the book was to help those who are wondering what the heck we’re all talking about. The buzz around SocBiz is tangible, however, I still have the feeling that few know what it entails. I can imagine many mid- and top-level managers would love some answers, a rough guide if you will. This is not a ‘for dummies’ book and it’s not a complete field manual for transforming your business. I too have learned form others. I wrote about Geoff Livingston’s personal exodus, and however this is not a novel, nor in print, nor a quadrillion pages thick.., it was still a tour de force. It forced to write down all my wandering thoughts into a coherent (and readable) format. For the next 5 days I’m offering my first E-book for free to my readers. In fact, if you know anybody who might benefit from this book, let them know, so they can get a copy too, then go ahead. Don’t forget to claim this wonderful find for yourself. Your friends will think you’re just awesome!! I am proud of my work (can I say that.., sure I can). I’m very content. I didn’t write it to become rich, I am a pragmatic realist (yes, that helps with Social Business too). But, I do want to share my achievement with the world, with my readers and friends. All I ask in return is let other people know about it and if you wish, leave a comment or a rating on Amazon. Also, feel free to leave a comment, I’d love some feedback. Below are the books I use, which are my reference (these are affiliate links, if you don’t want that, click on the links at the beginning of the post). I added “Why? Social Business” because, let’s face, it looks mighty cool. Good stuff Rogier, I look forward to reading this over the next few days. Putting together a report/white paper on this myself. I say a report, it’s commissioned more like a mini book at 40,000 words, but it would be good to get your feedback on it sometime. Thanks! I hope you enjoy it, love to hear what you think. And I’d be more than happy to look things over. Previous Previous post: Social Business is not about Social, it’s about Business. And that’s not always a good thing.